When my daughter got married recently, I was given the opportunity to say a few words at a pre-wedding dinner. I was paralyzed at first, not knowing quite how to express my feelings. Once I decide to capture my sentiments in the form of a food review, the words come to me more easily. I describe the couple as well-seasoned, harmonious, balanced, and whimsical. I also want to incorporate my favorite food adjective- crispy. One of the definitions is “having a pleasingly firm texture.” I’ve just concluded wedding planning with these two, so I can say with no hesitation that they are firm. When it comes to crispy food, I’m finicky. If something is supposed to have crunch, I want to hear noise when I bite into it. If a slice of pizza can hold its toppings without flopping over I’m jubilant, as most slices droop under the weight of their garnishes. This is why All-Purpose, the pizza-focused restaurant in Shaw from Chef Mike Friedman, delights me. Friedman earned kudos galore as chef/owner of The Red Hen, one of DC’s most respected Italian restaurants. His announcement of a second venture garners enthusiasm and high expectations. All-Purpose delivers. (I’m not sure they actually deliver. I mean this in the sense of fulfilling expectations). 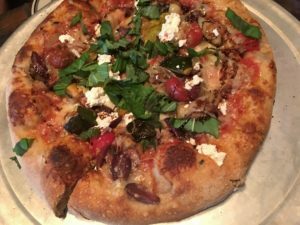 In All-Purpose, Friedman wants to replicate the pizza and rustic Italian dishes he grew up with in South Jersey. He puts the pizza dough through a three-day fermentation process and bakes it in a gas deck oven. The result is a crust that’s thick and bready, and as the chef intended it “holds the fold.” It passes my crispy test with flying colors. If you like like mushrooms, the Cossimo pizza is for you. Covered with roasted mushrooms, tallegio and grana cheeses, scallions, and a touch of preserved truffle sauce, this pizza is both earthy and heavenly. My group of seven is split between those who favor Cossimo and those who are Garden State fans. Garden State is topped with zucchini caponata, smoked mozzarella, black olives, baby tomatoes, and fresh ricotta. With two visits to All-Purpose under my belt, my favorite is the meaty Buona with pepperoni and a drizzle of chili honey. Give me heat, sweet, and crunch, and I’m pretty darn happy. For those with a firm allegiance to thin crust pizza, All-Purpose has plenty of satisfying options. After all, it’s an all purpose kind of place. Eggplant parm Jersey-style is destination-worthy all on its own. 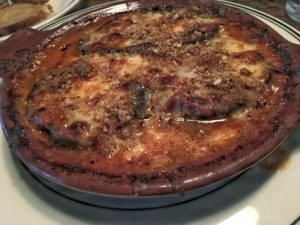 It’s lighter than traditional eggplant parmesan, with a topping of breadcrumbs bringing on the crackle. It’s hot and gooey and simply delightful. A visit here is actually best when it starts off cold. Sicilian tuna mousse with a thick coat of salsa verde gets scooped out of a jar and spread thickly on slices of toast. We admonish a server who tries to recover the jar too soon. It’s good to the last drop. 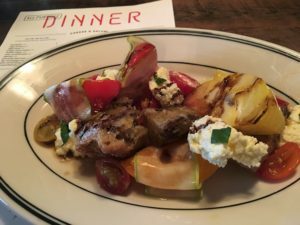 Heirloom tomato panzanella is presented with ribbons of summer squash, fresh ricotta, and tossed with balsamic vinegar- worth getting here before the season takes it away. House-made charcuterie and artisanal cheese also make for a fresh start. On the hot antipasti side are lightly fried cauliflower and broccoli with savory hazelnut-romesca sauce, feta ranch, and chives. We admire salt cod fritters with pickled vegetables and Sicilian tartar sauce as its placed before us, and then devour them instantly. When my friend asks if they serve lemonade, our server doesn’t think twice. “I can make it happen, ” she says, winning our admiration. If you can snag a booth do it. It’s a great way to enjoy the buzz, and hear your dining companions. The lively atmosphere makes All-Purpose a place where you want to linger. Do it. 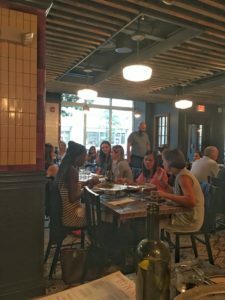 You can sip wine from a unique list curated by Red Hen sommelier and All Purpose co-owner Sebastian Zutant, or satisfy your sweet tooth with desserts from one of DC’s most popular pastry chef’s Tiffany MacIsaac. Her Buttercream Bakery is next door, but you don’t have to leave your table to enjoy the offerings. 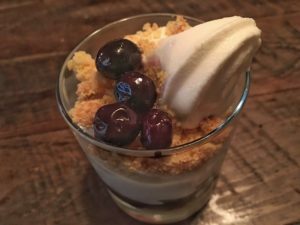 Summer corn soft serve ice cream topped with crunchy olive oil polenta cake crumble and roasted blueberries is a cool twist on classic soft serve. 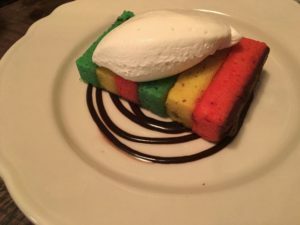 Rainbow cookie cake with marzipan, chocolate sauce, and crema warrants a “this is the best thing I’ve ever eaten” from one of my friends, who initially declares she’s declining dessert. As I’m winding up this post, I search once more for the definition of crispy. I come across this one on Urban Dictionary: neat, clean, trim, fashionable, with it, very good-looking. I can’t think of a better way to describe both the newlywed couple and All-Purpose.